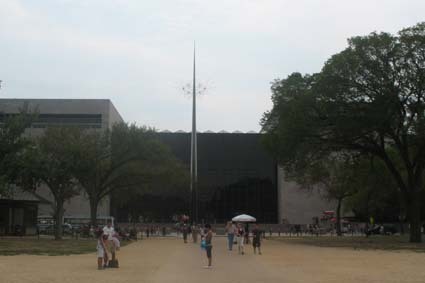 I went to the National Gallery of Art instead. It was a wonderful afternoon. 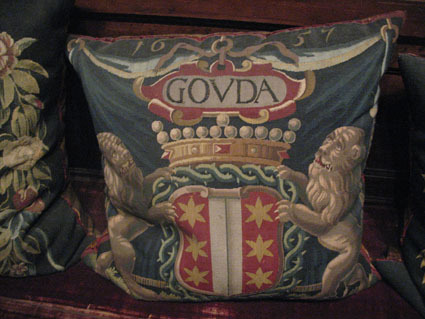 One exhibit was chock-full of period furniture and beautiful tapestries, including these pillows. You can see by the sign when they were crafted. I’m not sure when the right one was made, but I know where and when the left one was made! 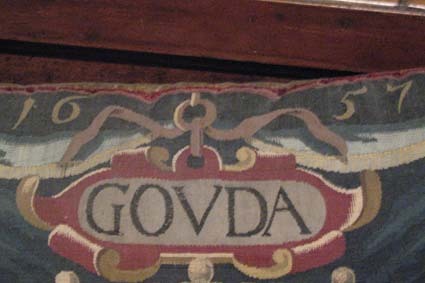 Gouda, The Netherlands, three hundred fifty years ago! Amazing. I don’t expect my works to last that long, but I tend to be surprised when I look at my works’ dates. They have a way of being older than I expect. What else did I see on my vacation? So many wonderful things! I’m still remembering it all fondly. I’m trying to make a slide show for a friend (she asked! ), but it’s slow-going. I have more images I want to share here, though. After DC we went to Gettysburg, PA. We saw the monument memorializing my great-great uncle’s regiment. That was very moving. 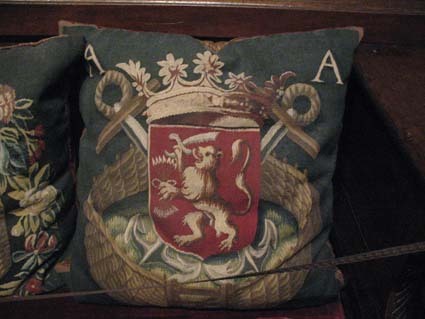 Perhaps I’ll post the photos another time, but today I want to share items from the museum. 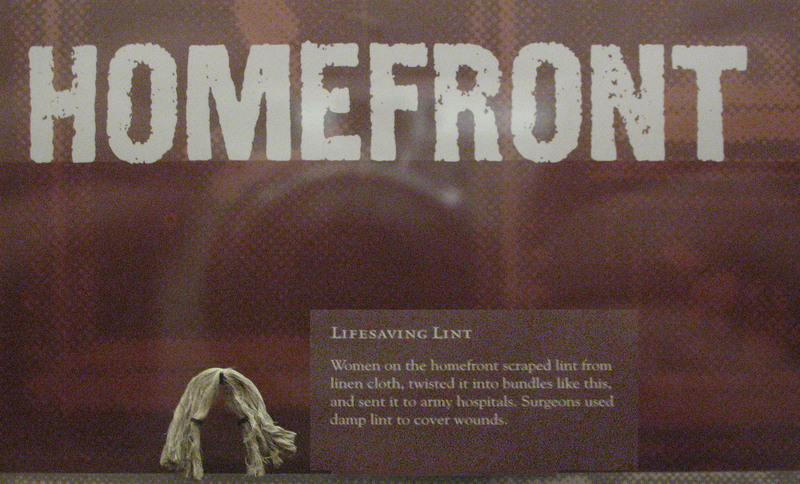 What the sign says: Women on the homefront scraped lint from linen cloth, twisted it into bundles like this, and sent it to army hospitals. Surgeons used damp lint to cover wounds. What its accompanying sign says: Back to Normal After the battle, the people of Gettysburg tried to reclaim a normal life in different ways. 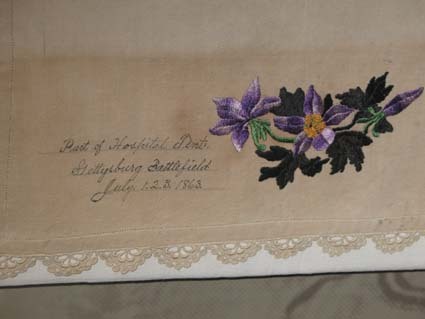 This piece of canvas from a hospital tent was embroidered, edged in lace, and transformed into a table runner. 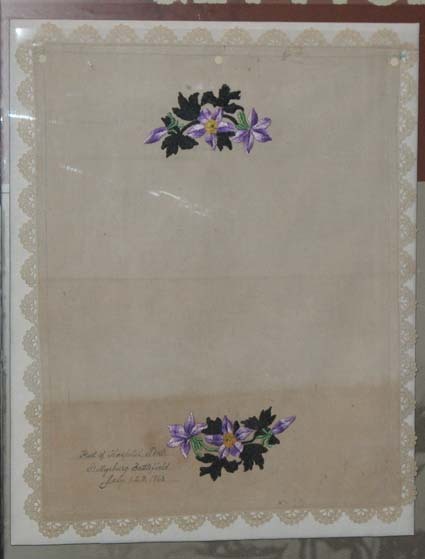 What its sign says: Patriotic Apron, about 1861 Mary Himes Fox of New Bethlehem, Pennsylvania wore this apron during the war. The bib contains one white star for each of the 34 United States. I’m itching to start something new; something not on my goals list, or from my newly acquired stash. I don’t know why such urges overcome me, but there it is. Today the boy and I are scheduled to do Zelda papercrafts. One GINORMOUS dandelion. Look at the Queen Anne’s Lace in the background. 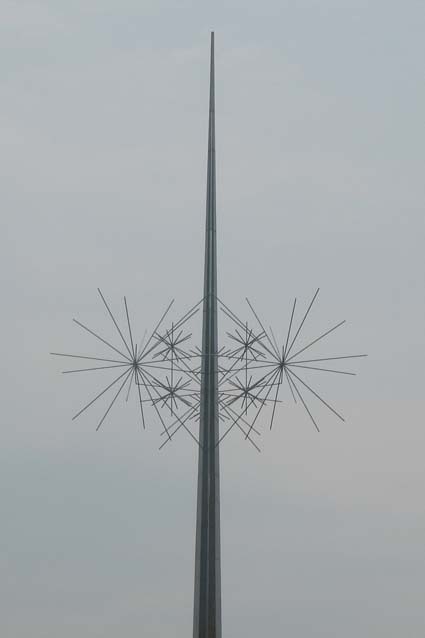 That’s a seriously tall, and large, dandelion. I love it. Here’s a close-up of the Queen Anne’s Lace. So pretty! These photos were taken at Big Meadows, Shenandoah National Park, VA, where we spent two nights during our trip. I would have linked to the official park page, but as I type, it’s not working. Why do I share a dandelion picture, you ask? I mean, besides liking the picture, of course. Because I love how it relates to my recent (yesterday) finish, Dandelion Clock! OMG, so cuuuuuuuttttte! I adore him. He will live in my son’s room. 22: is the number of days our trip lasted. 7+: is the number of states we visited (+ the District of Columbia). Ohio, Kentucky, Tennessee, North Carolina, Virginia, DC, Maryland and Pennsylvania. North Carolina and Maryland were first-time visits for the boy. 1,858: is the approximate number of miles traveled. Not the actual number driven, of course. I didn’t keep track of that. 232/574: is the number of miles my husband rode (232) out of the number planned (574). His back went out severely after he rode 127 miles (of 469) on the Blue Ridge Parkway. He was down for a week, and then he rode the entire Skyline Drive in Shenandoah National park (105 miles). 12: is the number of hotels we stayed in. Oak Park Inn in Waynesville, NC. 6: is the number of bears we sighted on the trip. 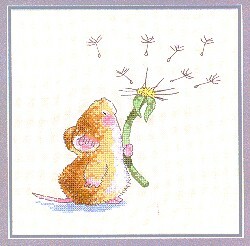 1: is the number of cross-stitch projects I completed. Like all good lies, there’s a kernel of truth to that statement. Let me ‘splain. No, there is no time. Let me sum up: The husband quit his job July 24. He doesn’t start his new job until mid-September. We leave Thursday for Cherokee, NC. We’ll be gone three weeks. We plan to spend 3 days in Washington, DC and hope to make it to Boston, and possibly Bar Harbor ME, with the husband riding Adventure Cycling’s Atlantic Coast bicycle route. These are the projects I’m planning on working on, if there’s time. Enjoy the rest of your summer, and happy stitching! Oh, and we had clam chowder. Did I mention clam chowder? It reminded me of my crane memorial. Was it made of paper cranes? Betsy by Sheepish Designs. OK, I started her before we left. But I did stitch on her in WA, so it counts. Since I’ve just come back from a trip, and I’ve seen this about, I’ll play along. I really wanted a North America map, but that’s not a choice. I’ve never left North America, but I’ve been to Antigua and British Columbia and New Brunswick and Quebec and Prince Edward Island and Newfoundland and Nova Scotia and Mexico in addition to my USA map. We’re headed for Seattle tonight, to visit the husband’s tribe. In my defense, I didn’t buy this chocolate. Katie falls victim to the wolves.